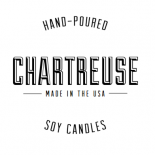 Chartreuse candles are poured by hand, triple scented and composed of 98% soy wax and 2% natural soy additives.This soy-based additive enables the wax to be poured at a hotter temp, reduces frosting, increases fragrance load and produces a smoother top. It contains no preservatives and is both natural and kosher. The lower melting point enables a better burn and provides better adhesion to the glass container. Soy candles are non-toxic and burn cleaner than paraffin, with no petrol-carbon soot which can blacken walls, ceilings, and furniture, contaminate ventilation ductwork in your home, as well as add toxic carcinogens into the air you breathe. They also burn slower than paraffin candles, making them last significantly longer. It is water-soluble, so it cleans up easily with soap & water. Soybeans used for soy wax are a renewable source, unlike paraffin, which consists of petroleum. Since they are vegetables, soy candles are naturally biodegradable. Being an Indiana gal myself, I can appreciate that using soybean products helps create important economic growth for the agricultural sector of the US economy. Soy candles are simply better for you and your environment. My fragrance recipes have evolved with my own candle tastes over the years. Some scents may resemble certain high-quality candles on the market, but chartreuse recipes are completely original. We triple scent our candles for maximum hot and cold scent throw. Please contact me with any additional questions you have regarding your luxury chartreuse candle! Feedback is always welcome. DISCLAIMER: Because all of my candles are specially poured by hand, there might be some variation in the look or texture of your candle. If you are disappointed in the appearance of a chartreuse candle in any way, please contact me for a new one.